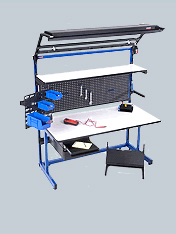 Modular components: add and reconfigure workbenches based on you business needs. Integrated back frame for accessories keeps worksurface uncluttered for optimal productivity. Micro-adjustable accessories: place them exactly where the operator needs them to reduce fatigue and injury. Ergonomics: effortlessly adjust the height for changing tasks and operators. Customize: choose standard accessories to create a unique workstation for your operator. Height adjustability: comfort while performing sitting or standing tasks. Robust construction with 14-guage steel and industrial laminate provides years of performance. Economical: simple and stable design at a fair price. Efficient: inventory storage at the workstation, fewer trips to retrieve supplies and products, inventory visible for easy management. 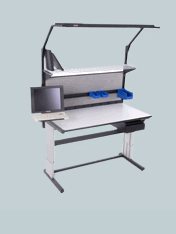 Ergonomic: height adjustable worksurface, angled conveyor reduces reaching. Modular: tools and accessories can be added above or below the worksurface to increase functionality. Save time by choosing one item number based on your needs. 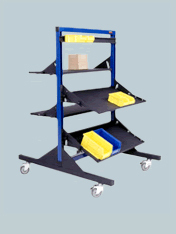 Increase efficiency and decrease injury using ergonomic carts. 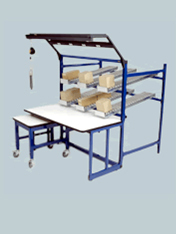 Add-on products such as the Basic Organizer, Flow Racks and carts upgrade your facility. 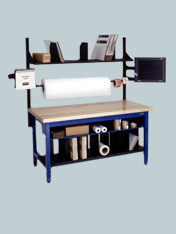 We will also offer any style of work bench and table including stainless steel for clean room applications.